Nursing mothers now have an important resource in the city of Schenectady with the installation of a new Mamava breastfeeding/pumping unit. 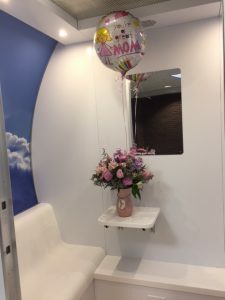 The portable pod, located on the SUNY Schenectady County Community College campus, provides nursing mothers with a safe and private space to pump or breastfeed when away from home. The lactation pod’s presence on the SCCC campus is part of “Creating Breastfeeding Friendly Communities,” a five-year grant awarded to St. Peter’s Health Partners (SPHP) by the New York State Department of Health. SPHP was one of six organizations statewide awarded the grants, which began in February 2017. The aim of the project is to fund a coordinated community network to build/expand community-based breastfeeding partnerships, policies and environmental changes for breastfeeding protection, promotion, support and care management within community settings and businesses, and with child care and health care providers. 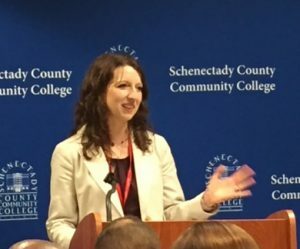 SPHP chose SUNY SCCC as the location for the Mamava station because of the college’s proximity to downtown Schenectady, and its ability to reach students, faculty and staff, as well as the general public. The grant, held by SPHP, covers areas of the Capital District that statistically have the lowest rates of breastfeeding and highest rates of obesity, as determined by Centers for Disease Control and Prevention data and Women, Infants, and Children Food and Nutrition Service utilization rates. Kristen Lynch, Outreach Specialist at SPHP and coordinator of the grant, is hopeful the Mamava’s presence will not only encourage more women to keep breastfeeding, but will also have a positive impact on the future of the community.